You will need: Cardboard, Scissors, Wool, Ruler, Pencil. Cut down 1/2 inch (12mm) each of the vertical lines from the top edge as far as the horizontal line until your cardboard has a row of slits across the top. (Refer: Complete Instructions below). 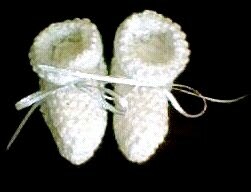 Take a ball of wool and put a strand in the top slit leaving a tail of about six inches (15cm). Run a length of wool down the first vertical line on the card. 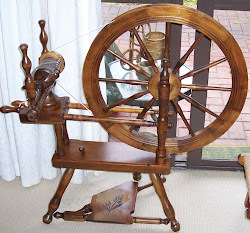 (The vertical strand of wool is called the Warp). Put the wool into the slit at the bottom and pass it round the back of the half inch (12mm) tab and then return it up to the top of edge. (This process is called; Warping the loom). When the loom is fully warped the top edge of the back will look like this. 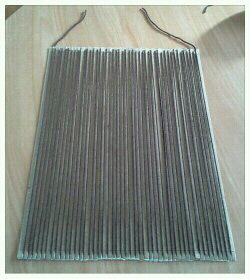 Continue in this manner until every vertical line has a length of wool running through the top slit down to the bottom slit. A view of top & bottom edges of the back of the loom when fully warped. NB: Conversion of Inches to cm and mm is approximate. 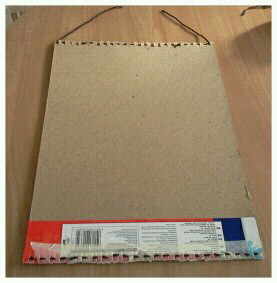 (1) See if you've got some cardboard at home that you can use - the piece in the photo is the back of an A3 size drawing pad. It measures 16.5 inches by 11.25 inches (approx 42cm x 28:5cm). 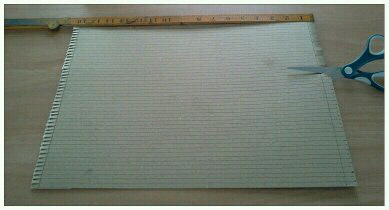 (2) Measure 1/4 inch (6mm) in from the top of the cardboard and mark it with your pencil. (2) Continue marking each 1/4 inch (6mm) along the top edge and then do the same at the bottom edge. (4) Place your ruler on the first 1/4 inch (6mm) mark at the top edge and aline the ruler with the first 1/4 inch (6mm) mark at the bottom edge then draw a straight line down the length of the cardboard. (5) Continue drawing a line down the length of the cardboard for each of the 1/4 inch (6mm) markings at the top and bottom edges until all the markings have been matched. 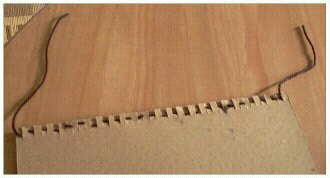 (6) Mark half an inch (12mm) down from the left side of top edge of the cardboard and do the same on the right side. (7) Matching the markings draw an horizontal line across the top edge and then repeat the process from (6) only this time at the bottom edge. (8) Cut down each of the vertical lines from the top edge as far as the horizontal line until your cardboard has a row of slits across the top. (9) Do the same at the bottom edge. 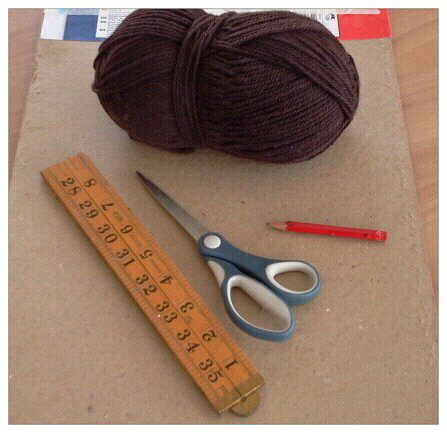 (10) Take a ball of wool and put a strand in the top slit leaving a tail of about six inches (15cm). 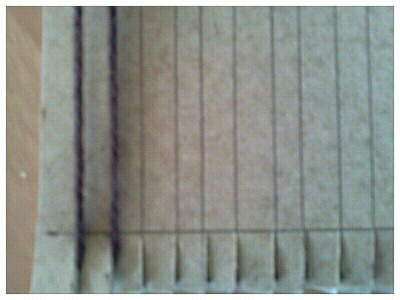 Run a length of wool down the first vertical line on the card and when you reach the bottom put the wool into the slit at the bottom and pass it round the back of the half inch tab and then return it up to the top of edge. Continue in this manner until every vertical line has a length of wool running through the top slit down to the bottom slit. 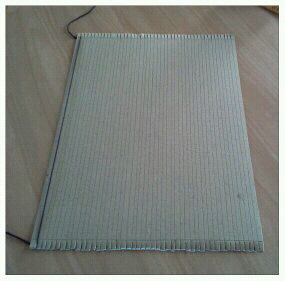 You have now got a loom with a warp thread ready for weaving.